Ich werde mich beruhigen und anfangen, sagte ich mir. Immer wieder sagte ich mir, ich werde mich beruhigen und anfangen, aber als ich es an die hundertmal gesagt hatte und ganz einfach nicht mehr hatte aufhören können das zu sagen, gab ich auf. Mein Versuch war mißlungen. I will calm down and begin, I told myself. Again and again I told myself, I will calm down and begin, but when I had said it around a hundred times and could simply no longer stop myself from saying it, I gave up. My attempt had failed. Never fear – this is merely the latest of a series of failed attempts to begin his task, with Rudolf known for his inability to complete any of the projects he sets himself. One of the reasons for his failure this time, though, is the lingering presence of his sister, who has just departed Rudolf’s home after a lengthy (uninvited) stay. As he thunders his anger regarding his sister’s disruptive influence on his work in the direction of the reader, we feel a sense of amusement and a certain sense of empathy for the frustrated writer. However, anyone who takes Rudolf at his word does so at their own risk; once he’s calmed down a little, we find that the relationship between the brother and sister is far more complex than he would initially have us believe. Gradually, though, Rudolf begins to change his story somewhat, admitting that the purpose of his sister’s visit has less to do with any desire to annoy him than with her concern for a man who has shut himself away from the world, one whose mental state is somewhat questionable. It takes a while to get to the point, around eighty pages in, when Rudolf (or Bernhard) gets around to criticising Vienna, but when he does, he doesn’t mess around, blasting out a three-page demolition of the city. And yet, once again, he later backtracks a little, admitting the capital’s role in his intellectual development, acknowledging that it is the one place which fuelled his passion for music. What comes through as the story develops, all of which (naturally) is told in the usual breathless Bernhardian monologue, is a rather more nuanced tale than you might have expected from the first few pages, or from reading other Bernhard books (e.g. Holzfällen/The Woodcutters). The writer gradually reveals his creation as an angry, yet sensitive man, someone whose health is failing him and who knows only too well that he is unlikely to ever actually finish one of his many ambitious intellectual projects. His sister, a far more practical person, far from trying to disturb his work, is actually attempting to keep him occupied, urging him to return to the big city, or at least go on holiday to warmer climes – something he eventually decides to do. And it is this trip, one he unexpectedly makes late in the novel (as a reader, you’re not even sure he’s left until he tells you he’s arrived…), which brings all the loose threads together. Up to this point, the title seems a rather odd choice, with a slightly abstract connection to the story despite its (ahem) ‘concrete’ nature. However, the word is an apt description of both what he sees in Mallorca, with the ugly, half-finished hotels, and his grey mood, and it takes a random encounter with a woman even more unfortunate than himself to finally ram home the horror of life and leave him flailing on the brink. I still haven’t read any Bernhard though I’m sure I’d like his books. He seems similar, in some ways, to Céline, one of my favourite authors. Do you think ‘Concrete’ would be a good one to start with? The only Bernhard I’ve read is Old Masters, though I now have another couple to read. I thought it was very funny – is that a normal reaction? If Wittgenstein’s Nephew is your next you will find it is, relatively speaking, as close to warm and fuzzy Bernhard as you can get. It has somewhat less vitriol and is, in the end, very sad. It is an autobiographical novel, chronicling the real life friendship between Bernhard and his friend Paul Wittgenstein (grand nephew of Ludwig) who suffered from serious mental illness. It is an attempt to atone for his behaviour toward his friend as he became increasingly ill. Surprisingly moving. Joe – I’m not sure Bernhard *can* get warm and fuzzy, so I’m intrigued! Well, not sure that I can entirely agree with his demolition of Vienna, even if it is through the mouth of one of his characters. Although there is something ‘off’ and dark about the lovely city, I do admit. I haven’t read this one. I can feel a Bernhard binge coming on (although interspersed with some other writers, otherwise it could all get a bit too much). I think I loved it because I was a child and only intermittently aware of prejudice and conservative outlook. Then again, I suspect it’s got worse in recent years. Great review, Tony. 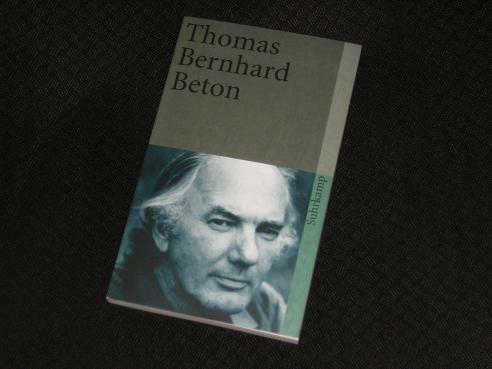 I have Béton on my shelf. I tried to read it but couldn’t pass the first pages. I’ll try again and persevere. and I got a taste of his humour, his gift for grumpy old characters. He’s not very nice to Austrian people and Vienne in this one too. I don’t think this play is available in English but it’s not a problem for you.